The opera “Figaro” starts off with an aria which is explosive in its opening notes. It builds up to an enthusiastic first piece which is called “Cinque, Dieci, Venti, Trenta” (five, ten, twenty, thirty); these being the numbers which Figaro is using to measure a space in the room he hopes will be the one he and his wife to be; Susana will be sleeping in. It is as Figaro is measuring a space for his wedding bed that his fiancée, Susana enters the room asking him to look at a hat which she has made for herself by saying “guarda un po mi caro Figaro, guarda un, guardo adesso il mio capello”, (take a look at my hat). The music at this point builds up as one can sense the almost ecstatic joy which Figaro and Susana feel knowing that they soon will be man and wife. It being as if they are in a climatic spiral, where things could not get any better than they already are; as they are on the threshold of the most wonderful thing the world has to offer. Figaro, for his part, on the one hand, is glad that Susana has made herself such a lovely hat and that they will be getting married but on the other hand, is slightly annoyed that she will not let him concentrate on measuring the space in which he has planned to place what will be their wedding bed. Figaro, however, is won over by Susana’s near ecstasy, as he starts singing with her that her hat is indeed beautiful and all would appear to be made just for them in the sheer delight which surrounds them. It is in my opinion that this particular area captures almost to perfection the joy which most couples experience before they are about to get married as well as the general mood which encircles them before such an event. From my point of view, I also find this opening piece to be the one which sets the tempo of the opera, not only musically but of the story and its eventual happy ending which goes through several moments of humor before Figaro and Susana; can be declared man and wife. Apart from liking this aria another reason why I have chosen to write about it is because the opera “Figaro” will be performed this year in Warsaw’s “Teatr Wielki” for the first time and it is with tremendous hope that I might be escorted by my Joannuszka Slisznuszka that I try to point out the magnificence of this particular piece. It is one of many classics in the opera “Figaro” which in fact is one of Mozart’s most successful operas along with “Don Giovanni” and “The Magic Flute”. My name is Gianni Truvianni, I am an author who writes with the simple aim of sharing his ideas, thoughts and so much more of what I am with those who are interested in perhaps reading something new. I also am the author of the book entitled “New York’s Opera Society”. 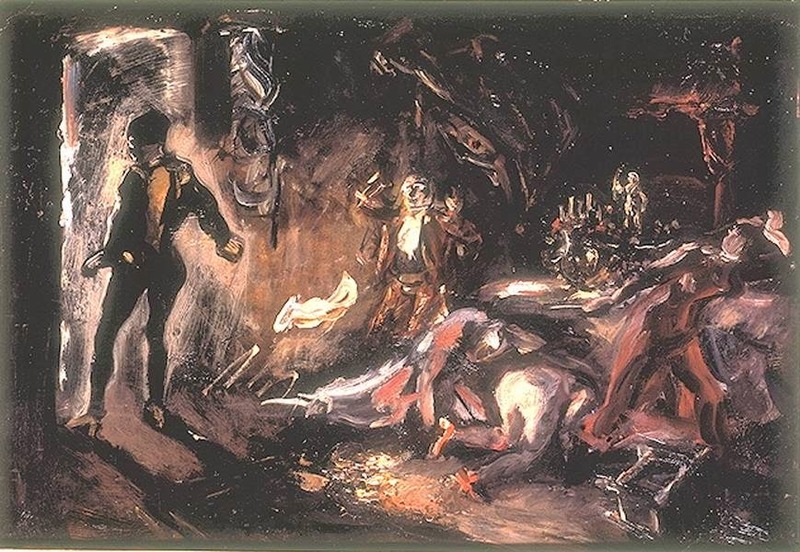 Great Moments In OPERA, Works Of MOZART: "La Ci Darem La Mano"
„Max Slevogt Don Giovannis Begegnung mit dem steinernen Gast“ von Max Slevogt - Alte Nationalgalerie Berlin. Don Giovanni’s aria of seduction “La Ci Darem La Mano” from Mozart’s opera “Don Giovanni”. About the aria “La Ci Darem La Mano” is taken from Mozart’s opera “Don Giovanni” which is based on Seville’s famous seducer “Don Juan”. It being “Don Juan” or “Don Giovanni” who makes it his life’s goal to seduce as many ladies as possible regardless of any factor other than that they be of the opposite gender. It is in the first act of this two-act opera that Don Giovanni spots a lovely peasant girl by the name of Zerlina, whom his taste dictates he must introduce to the acts of sexuality. This in spite of the fact, or perhaps motivated further by it that she is engaged to be married to a man by the name of Masetto. Don Giovanni, however, being one who is not deterred by such factors approaches the group in which Zerlina finds herself in at the time and offers the hospitality of his home so Masetto and her friends might take refreshment in his generosity; naturally while Don Giovanni himself keeps Zerlina in the private delight of his charm. Masetto, however, is cautious of Don Giovanni and mentions that Zerlina cannot remain at a distance from his society; only to be told by Leporello that she is in the hands of a gentleman who will take over his role of protector of her in the most gallant of ways. This precisely what Masetto feared leads him to protest further yet only to be told by Don Giovanni that if she does not leave without further reply; his actions he will repent. It is then that Masetto accepts Zerlina’s decision to remain in the exclusive company of Don Giovanni and declares he has understood how his love for Zerlina will be his ruin. Once alone Don Giovanni declares that though Masetto is a man of gallantry, he is not appropriate for Zerlina, for she deserves more than the mere life of a peasant; as he himself wishes to take her to wife. This being that which captures Zerlina by surprise as she in confusion repeats his offer to which Don Giovanni confirms what her ears have taken in by offering his castle and all that is to be found in it in the ways of joy. Zerlina for her part is still wondering as to the sincerity of his offer as Don Giovanni begins his aria of seduction with the words “La Ci Darem La Mano”. This meaning “let me take your hand” as he continues by adding that she will say yes. Zerlina still not sure converts this aria into a duet with thoughts expressed as “I want to but I do not want to, my heart shakes a little, I know I will be happy but I feel sorry for Masetto”. Don Giovanni, however, being of the ways of gentle persuasion continues his seduction by telling her he will change her lot in life. Zerlina at this point influenced not only by Don Giovanni’s words as well as caress becomes unsure as she claims again she wants to but does not want to, only to have Don Giovanni repeat he will change her lot as he urges her tenderly to go with him. Zerlina at this point no longer feels capable of refusing as she claims “non sono pui forte” (I am no longer strong) and joins Don Giovanni in a common cry of “andiam andiam a veri, a ristorar di veri, un inocente amor” (let’s go and consummate this innocent love). Don Giovanni has been successful at his attempt of seduction and sure that theirs will end in the ecstasy of passion takes Zerlina into his arms and kisses. Zerlina being more than willing to allow him to go on to her body as he will; for she will do likewise on to him. It, however, is as all was ready for Don Giovanni’s and Zerlina’s carnality that Dona Elvira (one of the many in Don Giovanni’s love life) appears and warns Zerlina not to give in to her seducer. This being advice which unfortunately for Don Giovanni, Zerlina heeds to as she and Dona Elvira take their leave of Don Giovanni and his ways. I, however for what concerns me would love to seduce the worship of my opera life, Angela Gheorghiu in the same fashion and though I can not sing; I most assuredly can create fantasy of delight that she might wish for ours to end in sexuality yet I, however, would not like for ours to be interrupted; as was the case with Don Giovanni and Zerlina. Mozart is recognized for completing twenty-seven concertos over the span of his career. He began composing his materials when he was four years old. He was able to play the same things over and over again from memory. Realizing his son had an extraordinary gift, his father began writing down the notes of the music when Mozart was only five years old. Some of these concertos that Mozart wrote are considered to be the best musical compositions of all time. The first works of Mozart were all written for the piano. This is the instrument he learned how to play at the young age of three. As he got older he challenged himself to write them for complete orchestras of instruments as well. Mozart always took pride in playing music that he composed on his own. He wasn’t willing to accept the boundaries in place for classical music at the time either. The most well-known concerto written by Mozart was composed in 1784. It is called KV 449 and is played in E flat. Over the next two years, he wrote ten more concertos. Some of them appear to be a continuation of the ones before it. This is similar to how some movies become sequels and even trilogies. When these various concertos are played consecutively you can hear an introduction, body, climax, and finale. While not everyone took immediately to the various concertos of Mozart, even the most difficult of critics had to agree he had talent. Mozart seemed to have a vision with his concertos that others could only imagine. Each piece seems to be more complicated and detailed than the one before it. At the same time though he continued to strive for something different than what was already being done in the area of classical music. Today many performances of classical music include pieces of concertos from Mozart. It is considered a tremendous honour to be a part of an orchestra that plays such pieces of music. It is a tribute to Mozart for his donation to classical music. While he always loved music and composing, the legacy he left behind is something that will always be a vital piece of history. Mozart was famous as a child performer. His father was a renown musician and used to take Mozart around Europe performing. Aside from being a cute child performer, Mozart was also a great composer. He is famous for writing "Twinkle Twinkle Little Star" at the age of five. Mozart was born in Salzburg, Austria but spent a lot of time traveling around Europe as part of his dad's way to display his son's prodigal talents. Mozart died at the age of 35. He lived during what is termed as the "Classical Period" in music. Mozart lived at the height of this period during the late 1700's. He did die due to multiple illnesses which at the time were hard to pinpoint as the precise cause of death. He didn't die because of contemporary composer Salieri poising him. In fact, their rivalry was greatly exaggerated to sell movies. Mozart could not secure long-term work throughout much of his adult life. When he moved to Vienna he especially had a hard time finding work. He was also paid poorly for his masterpieces.The location of his grave is unknown to this day because he died poor and had a poor mans burial. He did live at the time of Beethoven and was older than Beethoven. However, historical records never confirmed if they met or not. Regardless, Beethoven looked upon Mozart's music in high regard and was greatly influenced by his works. Mozart did get married and although he had 6 children, only 2 survived. One child became a composer, and the other child worked for the government. During Mozart's life "public music" was just becoming allowed. It may be hard to believe, but in the era's gone by, music was reserved for the Church and nobility. However, musicians like Mozart still aspired to hold a "court position" preferably working for a royal family. This would enable them to hold a steady income. Mozart worked at Salzburg court in his late teens the to early twenties but resigned in search of greater fame and travel. After a while of rejecting court position offers in his youth, he didn't get offered anything steady in his later years. Mozart was a generous and social person. Despite his various illnesses and small appearance, he held great attention in social settings. There are rumors that his wife didn't take good care of Mozart during his illnesses and didn't help him manage his money which was something he needed help with. Mozart also owed many friends money at the time of his death. There have been recent studies suggesting that listening to Mozart's music increases a child's intelligence. In fact, any complex classical music has the ability to increase the intelligence of a child and I believe that all children have multiple intelligences anyway. Some kids just love the sport and won't really want to sit around listening to Mozart for long periods of time. Other kids, love music and love to listen to music. Some kids are inclined to do both. Scientific research cannot represent the whole population. In terms of adult listeners, it is my goal that readers of this article appreciate the vast array of works that Mozart wrote in his short life and feel how these works encompass a variety of emotions and aspects of the Classical music style which Mozart contributed to. I hope you will be inspired to listen to Mozart's music via iTunes, CD's or YouTube and just let it flow over you. Then, to understand his music you must research about when that piece of music was written and what Mozart was going through in his life at the time he wrote that piece. At the time he wrote the piece of music Was he working for a court under luxury, or freelancing? Had he just experienced the death of another child or his parents? Was he in love or lonely? This is the KEY to feeling the expression and meaning beyond the sounds and understanding why certain Mozart pieces touch your soul the way they do. 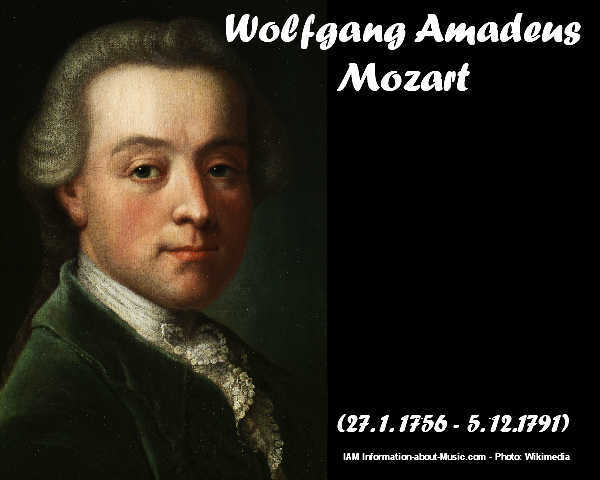 Mozart, born in Salzburg on January 27, 1756, was christened Johannes Chrysostomus Wolfgangus Theophilus. Born on the feast day of St. John Chrysostomus, his first two names honored the saint, and Theophilus came from Johannes Theophilus Pergmayr, his Godfather. Theophilus is Gottlieb in German, a name Mozart sometimes used, and Amadeus is Italian, the name Mozart preferred and the name with which he is identified by in the world of music. Leopold, Mozart's father, was a fine musician and had a wide reputation as a wonderful violin teacher. It is he who was Mozart's first music instructor and who introduced Mozart to the public. 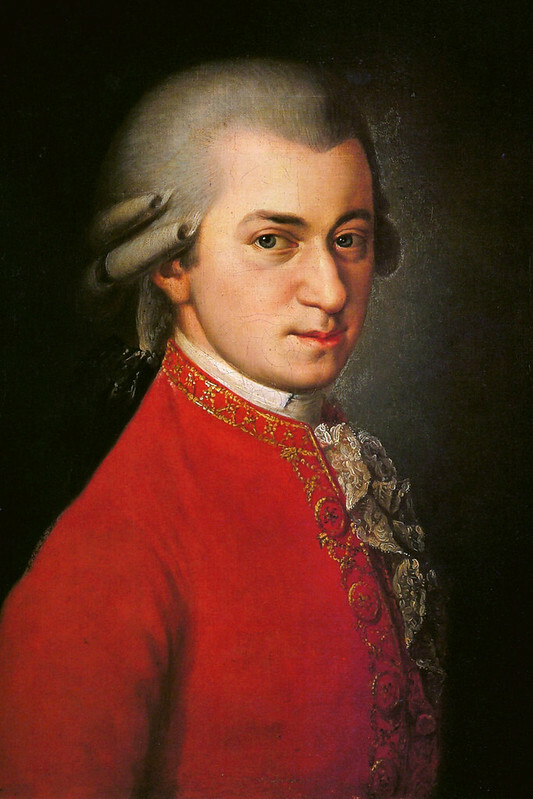 At the age of five, with his father's guidance, Mozart began to give performances. Mozart was a prolific composer of opera, keyboard works, vocal pieces, symphonies and chamber music. He was a gifted pianist, violinist, and conductor. Nearly all of his compositions were commissioned works, no commission being too small or too large. Mozart's music is a depiction of the man himself, ranging in moods of comical, noble tragedy, simplistic elegance, courtly majesty and heroic works full of the spirit of freedom. In December of 1774, Mozart traveled to Munich where he composed a set of six sonatas, K. 282 in E-flat Major included. These six sonatas represent Mozart's earliest surviving works in this genre. Mozart's early works are a light, cheerful style associated with the Galant movement in Italy. The Galant movement was an emphasis on classical simplicity (such as less ornamentation, an increase in the importance of the melody, musical phrases of a regular length and so forth), as compared to the complexity and ornate nature of the Baroque era. Mozart also modeled his compositional style after many of his contemporaries, including Carl Phillip Emanuel Bach, Johann Christian Bach, and Franz Joseph Haydn. It is Haydn's influence that is particularly noted in K. 280, 281, and 282. Mozart's keyboard sonatas were not originally intended for the concert platform, but instead for a more private context. They were valuable tools for teaching and they also provided repertoire material for Mozart's performances in the homes of patrons. The Sonata in E-flat Major, K. 282, begins atypically with an Adagio movement. The movement is in a two-part form or binary form. This first movement, in the key of B-flat Major, is very expressive melodically and demonstrates a strong interplay between forte and piano. The second movement consists of two minuetts, in the keys of B-flat and E-flat Major. The first of the two minuetts is simple, yet energetic, and reminiscent of Haydn's style. The second of the minuetts has a livelier left-hand accompaniment and "snap-rhythms." This second movement also exhibits the same striking contrasts between forte and piano. The third movement, in the key of E-flat Major, is in miniature sonata allegro form with a very short development and a full recapitulation. The upbeat motive recurs in a variety of forms, giving an impression of compact unity to the whole movement. This motive also serves as the thematic basis for the development section. The recapitulation begins exactly as the exposition. The coda, tail/ending extends the opportunity to show off the pianist's technical ability and ends almost as an afterthought. It is as though the pianist has stopped, but the music continues on. Mozart used Don Giovanni as a means to show his affinity towards the female roles he experienced in his life. He was one of the first in the 18th century to show that women could be intelligent and vibrant in public life. This extrovert portrayal of the women would be more prevalent at the beginning of the 19th century when women played an important role in European salons and the literary circles. Mozart took the audacious move of showing a "mélange" of social classes. He also showed men to be weak and in need of women rather than the contrary. His men are shown to be pathetic creatures. In the 18th century, women were given intellectual and artistic liberties as long as they were discrete. Their sitting rooms of the aristocracy had male servants and ladies-in-waiting. The dual existence was to show that their devotion to their husbands took precedence. Donna Anna was engaged to get married though she had been "scorned" by Don Giovanni. It would have put her aristocratic standing in question. Donna Elvira was also supposed to get married She was in constant conflict with Don Giovanni. Their love-hate relationship prevailed throughout the opera. Sexual freedom was part of the social etiquette in the period of Enlightenment. It was quite common for both men and women to have discrete extramarital affairs in 18th century Europe. Mozart's wife tolerated his affairs only with the servant girls. She would not allow him to philanderer with the aristocrats or other women from the social elite. One must understand Mozart often wrote his female roles for specific women with whom he had a relationship. He was the man who had never found his mother. It was well-known. Don Giovanni was never discrete. He had not come from the aristocratic class. Mozart was a Don Giovanni in disguise. He was not terribly discrete and he was still considered part of the court. He had his patron and worked under the orders of the Prince or the Church who employed him at the time of his musical composition. By the end of the first act of the opera, the three women unite together to show they are capable of existing without the need of their male counterparts. In the second act, they work to get Don Giovanni. Donna Anna, who was engaged, would have had a waiting room with either a man-servant or a lady-in-waiting. She was an strong-willed young woman who obviously pretended as though she had been humiliated. Don Giovanni would never have had access to her inner chambers. Donna Anna shows her aristocratic intelligence by running down the stair singing she had been scorned. Perhaps it was only her pride or ego which had been insulted. She is the stronger of the two showing Don Giovanni running away from her. Mozart liked strong, intelligent women. Donna Elvira also is a strong-willed aristocratic woman who had been deceived two times by Don Giovanni. She unites with Donna Anna. The two of them go looking for him. They find themselves at a tavern. Mozart mixed the social classes again. Don Giovanni who had tried to get into the aristocratic class is now singing to Zerlina, a young tavern girl who was also supposed to be engaged. Mozart shows three women who are off-limits to the outside world. The three men in the opera can be analyzed as weak and capricious. At the end of the 2nd act, the three women see Don Giovanni for whom he really was He is a young weak man who never gets what he wants. He goes after women who are impossible to have. The father who becomes the stone statue when he loses his life in a dual asks for Don Giovanni to repent. When he refuses, the Commendatore pulls him into the earth. Perhaps they both have been pulled into hell? Mozart made a courageous stand by showing that women's existence did not depend on men. Women stood together and achieved what they were after. In the opera, the three women stand together. Mozart was ahead of his time. They were strong, vibrant women who took control. Don Giovanni, the frustrated young man, looks for the mother he never finds. Mozart was a prolific composer who died a pauper. His infatuation with women and his low esteem for men would be the vice which would be his downfall. Wolfgang Amadeus Mozart was born in Salzburg, Austria in January 1756. His father was a minor composer and musician to the court orchestra of the Archbishop of Salzburg. Mozart had an astonishing talent for music and at the age of five composed some of his own pieces. His father, Leopold, give up his own career to foster his son's prodigious talent. In his formative years, the family traveled extensively in Europe where Leopold showed off the talent of his children -- his daughter Nanneri and his son, the child prodigy Wolfgang. From 1773 to 1777, Wolfgang was employed as a court musician to the Archbishop of Salzburg during which time he refined his skills. But he was frustrated because of the low salary paid to him. In 1781, he started working for the Archbishop of Vienna. He was somewhat badly treated which left him disgruntled and seeking other avenues. In August 1782, he married Constanza Weber with whom he had six children. In Vienna, he composed some of his finest works including 15 piano concertos before 1786. In 1786, he commenced work on the first of his three comic operas. Mozart and his family lived in Vienna for the rest of his life. From 1788 onwards his fortunes declined. He went through dire financial circumstances, a matter of grave concern. He fell ill whilst in Prague, suffering from pain, swelling, and vomiting which eventually confined him to bed. At the time he was working on his Requiem. Finishing it had become an obsession. He died in December 1971, his affliction still undiagnosed and was buried in a common grave in the presence of only four mourners. Mozart was one of the greatest musicians the world has ever known. The music of Wolfgang Amadeus Mozart is perhaps the most well-known of any composer the world has ever seen. Almost everyone has heard of how Mozart was composing music by the age of five (some urban legends even claim it was at age two) and performing before kings and queens, dukes and duchesses, before he was seven years old. He created more than 600 compositions, from operas to sonatas to full symphonies, and died tragically, mysteriously, before his 36th birthday in 1791. Some of his more famous pieces of music include Eine kleine Nachtmusik (A Little Night Music, 1787) and the operas Don Giovanni (1787) and Die Zauberflote (The Magic Flute, 1791). The movie Amadeus (1984) put into popular parlance the idea of Mozart as an immature and spoiled musical prodigy, given to fast living and obnoxious, braying laughter. It also portrays him as having been tormented by a brooding, jealous rival composer named Salieri, who may or may not have killed him. History paints only a slightly less dramatic picture. Born in 1756 in Salzburg, Austria, Mozart was the only son of a professional musician who very early on recognized the boy’s extraordinary musical talent. Today’s critical and politically correct eyes may look with disfavor on the way that Leopold Mozart exploited his son’s musical genius, but at the time it was neither uncommon nor unacceptable to parade child prodigies through the courts of Europe. The young Mozart spent his boyhood at the feet of kings and queens, performing and composing and perfecting his unique musical vision. He also spent his childhood suffering from various illnesses—tuberculosis, tonsillitis, and typhoid are just some of the many ailments he is said to have suffered. He was a sickly child and each bout of poor health left him reduced in vigor, more frail, and more susceptible to what would, ultimately, kill him. Legend has it that he was poisoned, but recent, more scientific explanation has it that he died of rheumatic fever, even while working to complete one of his greatest musical accomplishments, the Requiem. Such a characterization of Mozart’s music may well seem absurd to us today, who have been conditioned to think of Mozart as an unparalleled genius. Even before birth, babies are rocked to sleep by Mozart’s music being piped into their mothers’ wombs. We relax to his music, we grow to it, we learn through it; his music enriches and inspires our lives. Mozart in 1777, the year of the concerto. We all know that Mozart was an amazing pianist and composer who started his work at a very tender young age. Most of us also know that the Mozart sonata is a very important piece of musical history. However, do you know very much about these pieces? For example, did you know that these were not all pieces that he wrote specifically to play as a performer but also pieces that he wrote for the purpose of teaching his work to others? Taken as a whole, the sonatas represent a lifetime of creative work from one of the most amazing musical geniuses to have ever lived. For those who don't know much about Mozart, what you really need to know is that he was a genius and a prodigy. He was a classical composer from the late eighteenth century who played both violin and piano. He began composing music at an age when most children are barely about to enter kindergarten. Although he died young (at the age of 35) his early start allowed him to have a lengthy career. The music that he composed throughout this career is a testament to the talent that this man held within him. The most famous thing that Mozart wrote was the Mozart sonata. This is not a single piece of composition. Instead it is a series of works known as sonatas that are each numbered sequentially. What we can hear when we listen to them is that he developed his musical abilities throughout his brief lifetime, always bringing new twists and turns to the work. Some of them are simple, light and airy whereas others are dark, dramatic and difficult to play. The circumstances that Mozart was experiencing as he went through his life are played out in the different styles that he composed within the pieces. The majority of the reason that Mozart composed his work was because he wanted to perform it. He started performing music at a very young age and was proficient at playing multiple instruments. The music that he created was his art. The purpose of creating it was to find self-expression and then to share that expression with others by playing it on his own musical instruments. He created his music because it was his passion and his life's work to do so. He created it in order to play it. And one can assume that he was driven by an inner need to create this art; he would have probably created it even if no one would listen to it but himself. However, the Mozart sonata was not only created so that Mozart could perform his art for others. He was also someone who was interested in teaching musical skills to other people who were interested in learning it. There are some that he wrote for the express purpose of using them as teaching tools. It takes different skills to compose a classical masterpiece than it does to compose a piece that you can use to teach music to someone. That he was able to do this so successfully says even more about Mozart's genius than does the fact that he started composing at such a young age. The Mozart sonata is an important piece of work for a number of different reasons. It shows how much can be done with one type of musical form. The series of sonatas can be viewed together to show us the ups and downs in Mozart's personal and professional lives. And students can use the pieces individually to learn how to play the violin or piano with much of the same skill that Mozart had himself. No other body of work says as much about the artist and still provides so much function to others as do the Mozart pieces. Andy West is a writer on a variety of topics, including music. Mozart was one of the greatest composer's that has ever lived, and he has left us with a large library of unforgettable pieces, including the Mozart sonata. Joannes Chrysostomus Wolfgangus Theophilus Mozart was born in a house on the Getreidegasse in Salzburg, Austria, on 27th January 1756, the feast of St John Chryostom. His parents were Leopold Mozart and Maria Anna Pertl. He was the last of seven children but only himself and his elder sister Nannerl, survived into adulthood. Later in life the boy would choose to adopt the latin 'Amadeus' in place of the Greek Theophilus. Wolfgang's older sister (whose was called Maria Anna but always known as 'Nannerl') showed musical promise from an early age and began to learn the harpsichord in 1758 at the age of seven. Wolfgang seemed interested in her lessons and began to learn the instrument himself at the age of four and soon picked up some of her pieces. Incredibly he had, by the time he was five, managed to compose a few simple pieces of his own with the help of his father. Leopold Mozart was at that time Court Composer to the Archbishop of Salzburg and was an accomplished composer and well respected teacher. However he realized that Wolfgang's talents were exceptional and decided to concentrate on the musical development of his two children. He arranged for Wolfgang to perform publicly at the University in Salzburg in 1761 and over the next few years undertook a number of lengthy tours of European cities where the young Wolfgang and Nannerl would perform for the entertainment of the Royal Courts.These trips had their hazards. They could be lucrative but also highly expensive. Both Wolfgang and Nannerl were seriously ill on more than one occasion contracting both Typhoid Fever and smallpox. Mozart's first opera, La Finta Semplice, was performed in 1769, when he was just thirteen, in the Archbishop of Salzburg's Palace. When they finally returned to Salzburg Wolfgang spent time composing and was also appointed to the post of konzertmeister. However things changed when the old Archbishop, who was tolerant of the Mozarts extended absences,died. The new Archbishop was not so amenable. In 1777, at Mozart's request,the Archbishop released him from his post. He also took the opportunity to dismiss Leopold at the same time, although he was fairly quickly re-instated. Mozart set off on tour again but this time with his mother. It turned out to be disastrous. Without his fathers strict discipline Wolfgang, now 21, was more interested in enjoying himself than working. At one stage they were almost penniless and had had to sell some possessions in order to continue their journey. In July Frau Mozart became ill and died. Mozart returned to Salzburg and returned to his former position which his father had managed to secure. This didn't last long - the Archbishop dismissed Wolfgang during a trip to Vienna where they attended the celebrations of the accession of the new Emperor, Joseph II. Leopold was horrified but Wolfgang regarded it as a golden opportunity to stay in Vienna. He did reasonably well there teaching and composing. Then he shocked his father again -by announcing he was to marry. Leopold protested but to no avail and the marriage between Wolfgang and Constanze Weber took place on 4th August in St Stephens Cathedral. The couple enjoyed relative success for a few years with Mozart's music being popular and there being no shortage of pupils. However they had an expensive lifestyle to maintain and some jealousies began to emerge from other composers. A huge blow came when on 28th May 1787, Mozart's father died. Mozart's financial situation became worse and by 1789 he was regularly requesting loans from friends. He toured again but had little success. He was working hard and earning money but their outgoings were such that they had constant financial worries. Emmanuel Schikanader, was an actor,singer,writer and an old friend of Mozart's.He was the manager of the Theater auf der Weiden in the suburbs of Vienna and he suggested to Mozart that he write a pantomime type opera in German which would have mass appeal and, most importantly, be profitable. Mozart agreed, probably in desperation for money and worked on it ( The Magic Flute) through the summer of 1791. It was a huge success and brought temporary relief financially. During this time Mozart received an anonymous letter asking him to compose a requiem mass. Although it was a strange request he decided to accept as there was a significant fee offered. However Mozart became overworked and his health began to decline. He was desperate to complete the commission but was becoming exhausted and on 20th November his condition worsened so much that he took to his bed. With the help of his pupil Sussmayr he attempted in vain to finish the Requiem but got only as far as the Lachrymosa. As Mozart's condition deteriorated he suffered from fever, vomiting and swelling. On 4th December Mozart went into a coma. In the early hours of 5th December 1791, the greatest composer the world has ever known, died. In a final ironic twist to the tale, the emperor confirmed Mozart's appointment to the post of Kapellmeister at St Stephens, a position which would finally have given the Mozarts lasting financial security. Among the world’s favorite operas, we find three of them with a libretto penned by Lorenzo Da Ponte and music by none other than the astonishingly delightful Viennese ear-confectioner Mozart. The list is a delight in itself: The Marriage of Figaro, Don Giovann, and Così Fan Tutte. We learn in the new book, The Librettist of Venice, by Rodney Bolt, that Da Ponte grew so close with the unequalled Mozart – both of whom, we learn, were not only talented but vain, insecure and ambitious – that while writing Don Giovanni, they worked in adjoining lodges and shouted to each other through their windows. Da Ponte even dared to contend with Mozart, who believed the text should be subservient to the music, while Da Ponte was certain that the words should be primary, in fact, that without his poetry even Mighty Mo’s music would be nothing. Yet how Da Ponte tumbled from the heights. Hard as it may be to imagine, he wound up in New York, running, at one time, a grocery store on the Bowery. Brilliant as an artist, he was apparently, in his personal life, a managerial moron. Or, said another way, while talent flies, practical reason just plods along, like a relative moron. Da Ponte , born Jewish, was, as a result of his father’s having decided the family should become Catholic for the easement of a life of trade, ordained a priest. But his real vocation was married women. His exploits, we learn, rivaled Casanova, who became his pal and, if we believe such a thing is possible in the category at hand, his mentor. Da Ponte himself admitted a shortcoming in comparison with his rival for insincere relationships: he didn’t have Casanova’s purported talent for fleecing the women he falsely wooed. In fact, Da Ponte claims he actually loved the ones he made out with. He also considered himself adroit politically, but his moves were disastrous. He upset the successors of Joseph II so much he was exiled from Vienna. Now,still technically a priest he was married to a younger but more wisely practical woman named Nancy Grahl, but even she was unable to keep the man out of bankruptcy in London and again in America, where they moved in 1805, because her family had settled here. He attempted to establish Italian opera companies when English-speaking audiences had little interest in them. To add onions to opera, the grocery business failed. He finally became a teacher, bookseller and wannabe impresario. On the positive side, New York turned out to be the most agreeable spot for him. It was relatively liberal, and Da Ponte found himself a favorite of the cultural elite. He became the first professor of Italian at Columbia University. While the position was pretty much ceremonial, Da Ponte has the double distinction of having been the first Jew and first priest on the school’s faculty. He lived on into his 80’s, revered but regarded as eccentric. He was charming man who made a profession of being European when such a state was still considered novel. Yet when one compares his everyday doings with his winged collaboration with Mozart, one can only shake his head with the recognition of how quicksilver brilliant the remarkable syntheses of talent are, way up in mental processes we can only hope will drop answers into our expectant consciousness, compared to the "first we do this and then we do that" plodding of the practical but still invaluable mind. Wolfgang Amadeus Mozart [1756 - 1791] began his amazing but tragically brief musical career as a child prodigy, making appearances as an accomplished violinist and keyboard player from the age of five. He was born in Salzburg in what is now the country of Austria, and lived most of his life in that land (then known as the Holy Roman Empire), although he traveled extensively throughout Europe -- in the company of his family as a child, and later on his own so as to supervise premieres of the various musical works he composed. Despite Mozart's relatively short life -- the cause of his death at age 35 has been attributed to various ailments down through the years, although it was most likely a recurrence of rheumatic fever -- he was incredibly prolific as a composer. His material clearly exemplified what is known as the Classical style, the period of music that immediately followed the Baroque. In addition to 41 symphonies and close to a dozen masses and other large choral works (including his Requiem, which was left unfinished at his death), Mozart composed hundreds of chamber music pieces for various solo instruments and ensembles. Despite his success as a composer, however, he struggled financially throughout most of his life. The era in which Mozart lived was a financially perilous one for writers of music. Without wealthy patrons to sponsor their works, most composers ended up working for the church in various roles. This might include organist, concertmaster, choir director, or some combination of the three. In his late teens, Mozart was assistant concertmaster for the archbishop of Salzburg but tired of the drudgery of composing only liturgical music while working with a group of equally low-paid musicians. Through the influence of his father, Leopold, a more prestigious post as Salzburg court organist was arranged; this helped raise his profile with the monarchy, which was where the real money resided. Following Wolfgang's marriage to Constanze Weber in 1782 -- the couple relocated to Vienna soon after they were wed -- and thanks to the successes he enjoyed from having his music (especially operas) proliferate throughout Europe, five years later Emperor Joseph II named Mozart to succeed Christoph Willibald Gluck as the court's official chamber composer. Despite the relative financial stability this position afforded him, Mozart's extravagant lifestyle outstripped his ability to pay for it. In a way, though, the world of music is the beneficiary of this indebtedness. Because of all the money he borrowed to pay for a fashionable Viennese apartment, private schooling for the two children (out of six) who survived infancy, the years 1787 through 1791 were his most prolific by far. While his instrumental works remain the core of his legacy -- an expert once suggested that a Mozart composition is being performed somewhere in the world every second of every day -- it is his operas that seem to have enjoyed the greatest acclaim down through the years. Among his most famous pieces are works from his mature years, including Die Zauberflöte ("The Magic Flute"), The Marriage of Figaro, Don Giovanni, and Cosi fan tutte (roughly translated as "Women Are Like That"), the latter three collaborations with librettist Lorenzo da Ponte. But some of his earlier operas continue to enjoy support on the world's stages, notably Abduction from the Seraglio . His final opera was La clemenza di Tito, which premiered only three months before he died. The video clip that accompanies this article is the final scene from "The Marriage of Figaro." The performers include Bryn Terfel [Figaro], Alison Hagley [Susanna], Rodney Gilfrey [Count Almaviva], and Hillevi Martinpelto [Countess Almaviva]. The conductor is John Eliot Gardiner.